My mom learned this recipe from my paternal grandmother, and I learned this recipe from my mom. I suppose my grandmother learned this from her mother or mother-in-law as well. I am so glad I can continue on my grandmother's (or who knows it could be my great great grandmother's?) recipe today. 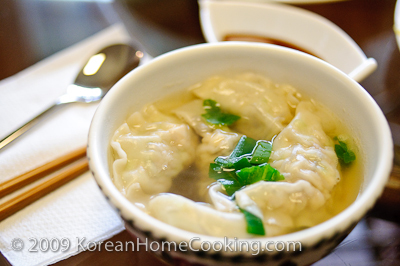 Dumpling is widespread throughout Korea, but technically it is a specialty of the northern province. My grandma comes from Hwanghaedo, the north western part of Korea which is now North Korea. When the Korean war broke, my grandma took a refugee to the south with my dad and my aunt. My grandfather was supposed to join her in the south after taking care of some errands in north. But he never made it to the south, because the border was fenced off overnight between the south and the north right after they parted. This is a sad part of my family history which my generation doesn't have any memories of but our grandparents or parents do and have to live with them. I am sure many families in Korea share similar family histories. This recipe makes 50 dumplings which serve about 5 to 6 people depending on one's appetite. When my mom makes dumplings, she usually makes several hundreds of them at once and freeze them for later use. When freezing the fresh dumplings, there is a two-step process which my grandma used, and my mom continues the same way. On a recycled styrofoam plate (which is found in a meat or vegetable packaging), place each dumpling at least 1/4 inch apart and freeze for 1 hour or so. After that, move all the dumplings into a small zipper bag and freeze them for a longer period. The initial freezing process prevents dumplings sticking to each other. 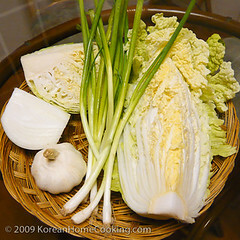 From the clockwise direction, main ingredients include scallion, garlic, onion, cabbage and napa cabbage. 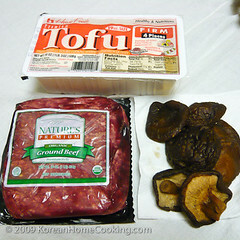 Also prepare ground beef, tofu and shitake mushroom. 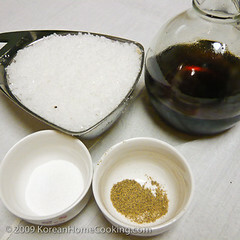 For the seasoning, prepare coarse sea salt, sesame oil and salt and pepper. 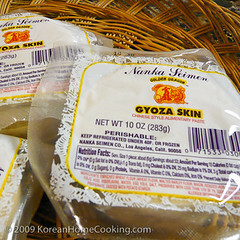 And gyoza skin. If you want home-made gyoza skin, simply make it with the dough of flour, water and some salt. 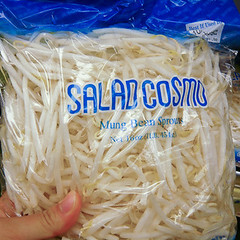 You would also need a bag of mung bean sprout. Julienne the cabbage and napa cabbage. Try to slice as thinly as you can. Otherwise, they are going to poke right through the gyoza skin. 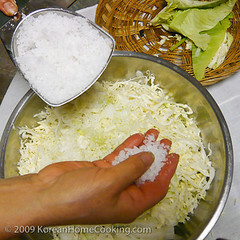 Sprinkle course sea salt over the cabbage and napa cabbage shreds, and set it aside for 2+ hours. 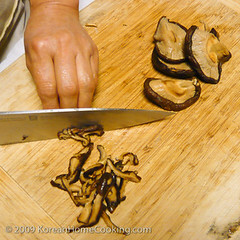 Meanwhile, julienne other vegetables (onion and shitake mushroom). 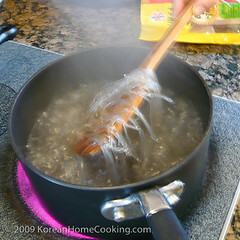 Also cook transparent vermicelli noodle (dangmyun) per instruction and cut 1-2" long. 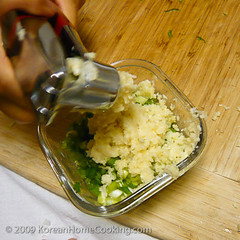 For the seasoning, prepare crushed garlic, chopped scallion, salt and pepper. 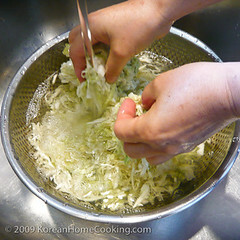 Drain the water generated from salted cabbage and napa cabbage from Step 7. Wash the mix and drain completely. 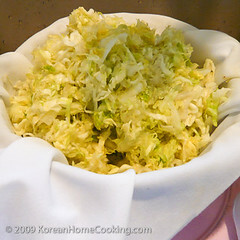 Place the cabbage and nappa cabbage in a thin coarse piece of cooking cloth. 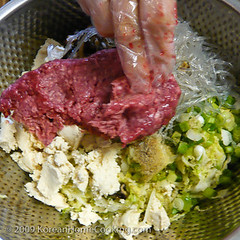 Add cooked vermicelli from Step 9 and crushed tofu to cabbage mix in Step 12. Twist the bag and completely squeeze out the water from the mix. My mom sometimes uses the laundry washer to borrow its spinning power. If you want to use washer, be sure to set it to the spinning cycle. 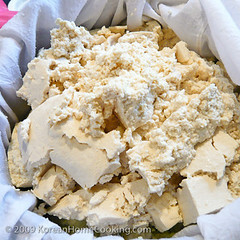 Place a spoonful of mix in the center of gyoza skin and seal the trim with water or egg white. Thank you so much for sharing your family recipe. 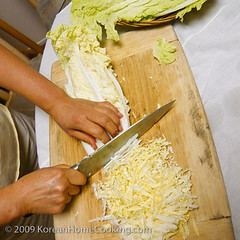 I'm not Korean but I love home cooked Korean meals and this will sureley have the taste and feel of one! Again thank you, thank you, thank you. Hi Tey - Welcome! Thank you for your kind words. Though I am not a frequent blogger, I hope you continue to stop by once awhile.